This entry was posted on March 9, 2014 at 7:50 pm	and is filed under Uncategorized. 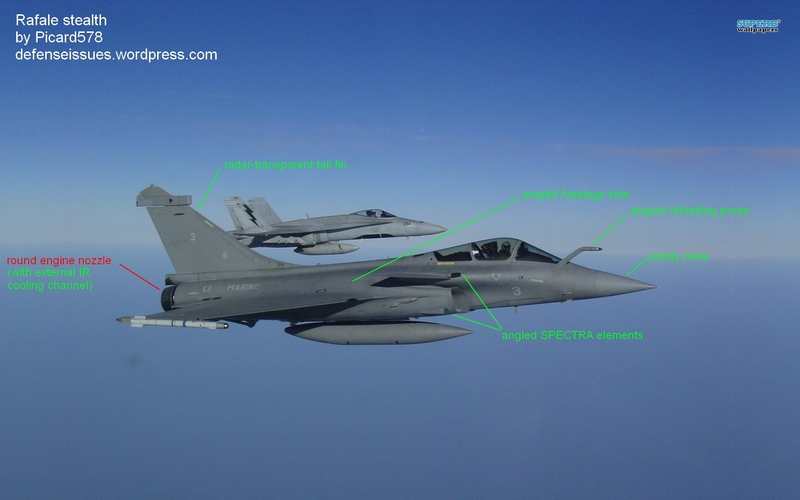 Tagged: Dassault Rafale, Eurofighter Typhoon, fighter aircraft, j-10, j-20, SAAB Gripen, signature reduction measures, stealth. You can follow any responses to this entry through the RSS 2.0 feed. You can leave a response, or trackback from your own site. 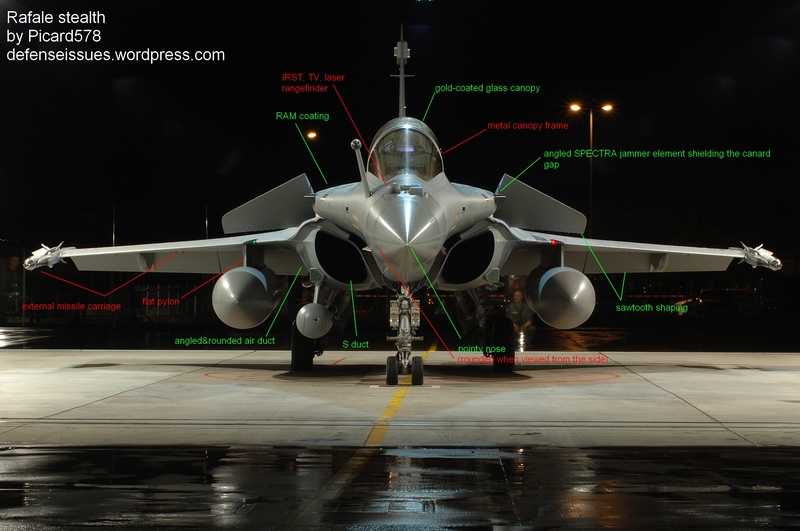 Among these airframes, it looks like the Rafale is the best designed of them. That and the fact that its probably the most aerodynamic (probably the best L/D ratio among them). Actually, if you have the time, could add the American fighters? Though, thing is, US fighters other than the F-22 and F-35 have no signature reduction measures, F-16 does have some aspects which reduce its signature though these are accidental. Gold tinded canopy on F-16 was not accidental. It was specific to reduce RCS. 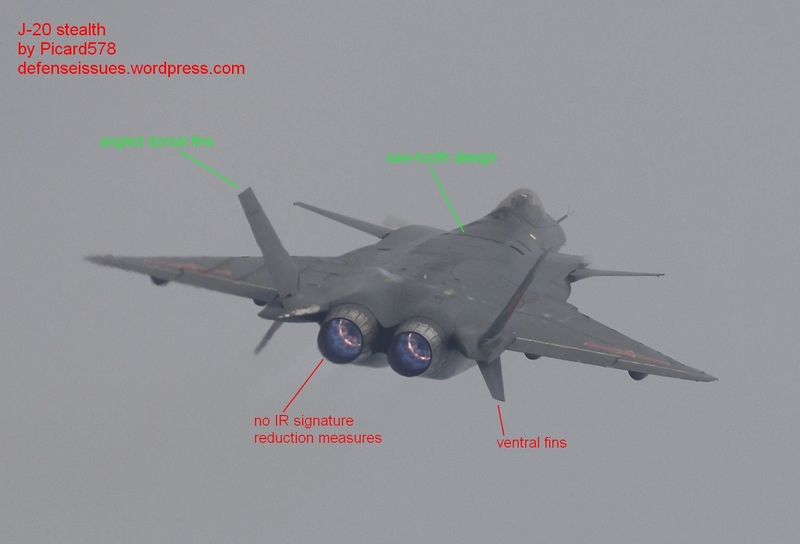 Quite shocking – only the F-16 has real thermal signature reduction measures … hmm. Perhaps not surprising though? They seem to be too obsessed then with radar? 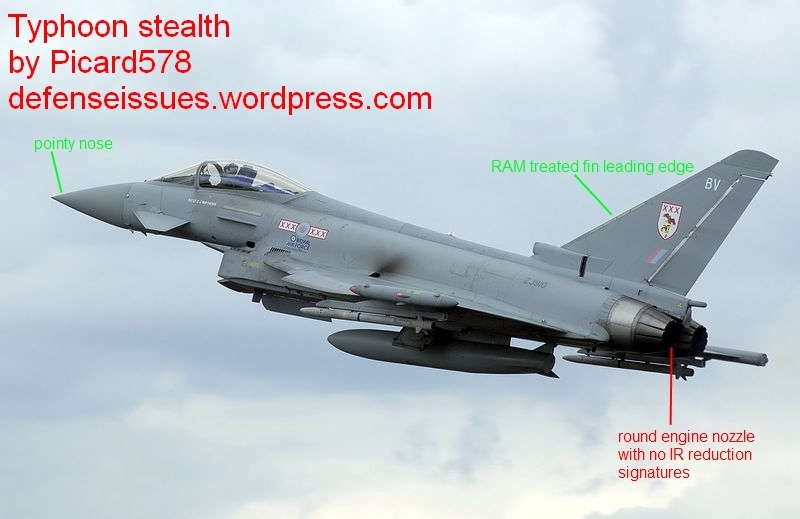 typhoon has low-observable coating on canopy, see http://www.sae.org/aeromag/techupdate_6-00/04.htm. If you don’t see it, it doesn’t mean it isn’t there. It is forgotten that Gripen is a smaller airplane than the others. Size is key to all sorts of footprint to keep your profile low, not just in the air. WVR a Rafale will be easier to see than a Gripen. 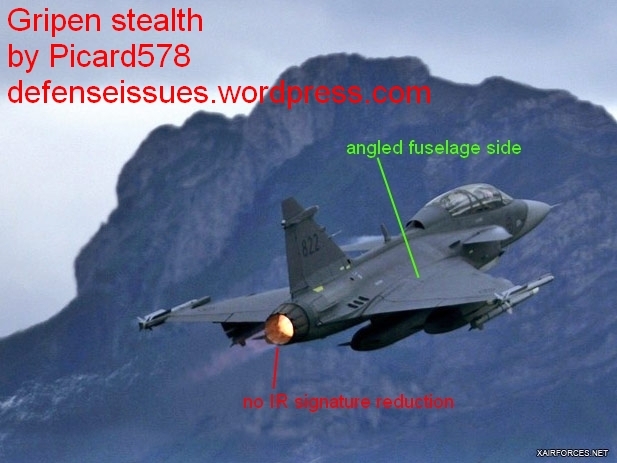 Gripen is well shielded from ground IR by using cooling exhaust behind canopy (at the cost of rear visibility). Good or not, it’s a design to make the airplane harder to see from the ground. Gripen has exceptionally good aerodynamics which gives it good performance despite being underpowered (solved by E version). The fact remains that the others have TWO more powerful, hotter, engines. They are also substantially wider meaning higher air resistance. Another often forgotten design feature of Gripen is its small tail fin compared to the other aircraft, again lower air resistance and lower IR profile. The Gripen would be deployed from road war base. A lesser plane might be more “LO” but what does it matter when your base is extremely observable and will be targeted immediately (example of comical imbalance: Norway – F35’s on 1 base). See, LO is not only about high tech “cloak fields” where designers try to have the cookie and eat it, being small is the fundamental, prime, LO-factor. Rafale really looks great in sales brochure being literally “gold coated” etc, and I love the plane, but it’s annoying to see the Gripen be constantly underestimated, even on one if it’s main merits – being a small single engine design. The French advertise Spectra and other things all over the internet while even interested people don’t seem to know what TIDLS is. TIDLS meant, among other things, that Flygvapnet developed a tactic where the airplanes in a group fly several miles apart and not with a wingman right next to you. Because of TIDLS pilots still know exactly where his wingman is. There is an entertaining account from a Hungarian pilot here where an F16 turns in behind him, unaware of the hidden wingman, and gets immediately killed. TIDLS is old today but the next generation of the system will be in Gripen E.
RCS on Gripen is classified. The Flygvapnet is traditionally very secretive, but the plane is rumored to have an RCS 1/10 that of F16. This is about signature reduction measures, not the end result or vulnerability on the ground. Gripen’s engine isn’t weak for the aircraft’s weight to reduce the IR signature but because stronger engine wasn’t avaliable. And everything else you have noted was already pointed out in other places. Fair enough, I see your point but find it a strange isolation of certain systems. In practice those things all come together. 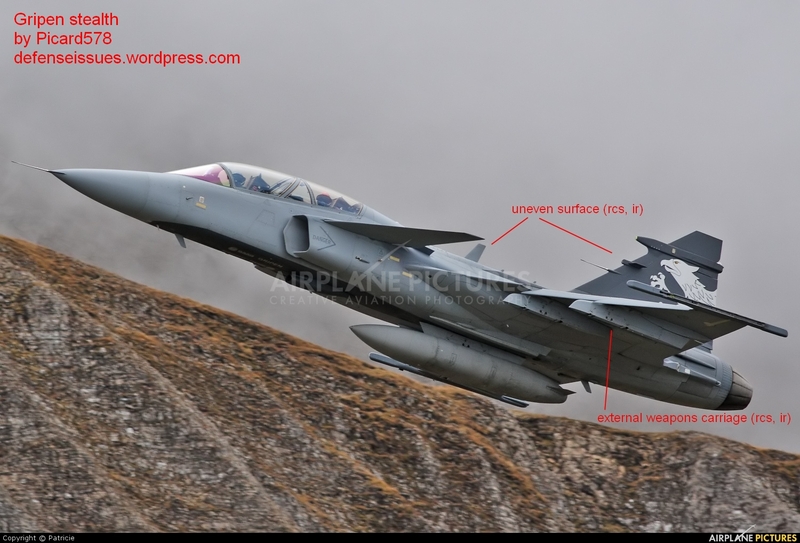 Gripen C suffers from a lower power to weight ratio than the other Eurocanards. Since the airframe is exceptional at maintaining energy this is okay, but more acceleration is a good thing. Another “signature reduction” you left out is the Typhoons ability to carry for BVR missiles semi-conformally, meaning a Typhoon can fly in air to air configuration almost “clean”. One thing I always wonder on radomes: they are radar transparent, right ? (otherwise the plane’s own radar could not emit and receive waves). 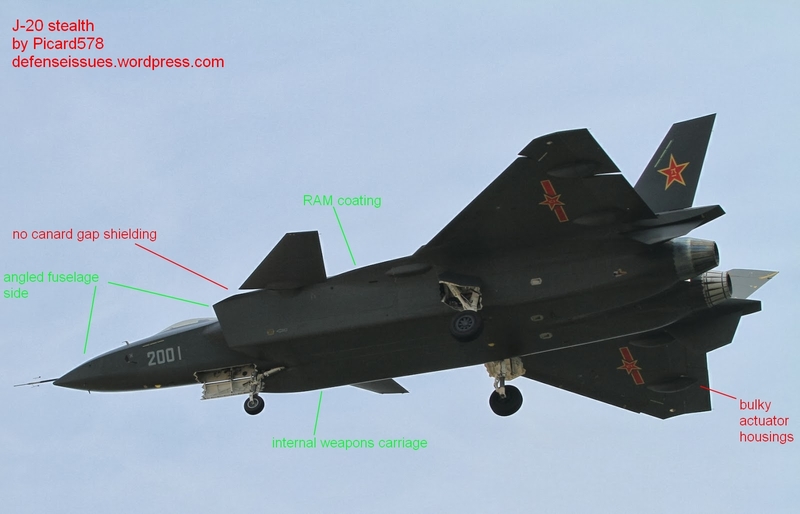 So, any airframe carrying a radar (including allegedly stealth fighters) has a huge main frontal RCS due to the perpendicular (to the forward direction) shaping of the radar itself. I just find that strange, maybe the radome is radar-transparent only to thin-band frequencies but radars can now work wide-band. Any ideas on that ? Yes, radome is radar transparent to a certain set of frequencies else radar wouldn’t be able to receive the signal. So a radar frequency agility is always limited by the radome then ? Yeah the radome has to be. Pretty much the problem with radar is that it tends to add a lot of complexity and cost to the aircraft. Plus by adding radar, you gotta balance the aircraft now because the center of gravity has shifted more to the front. Radars weigh quite a bit and sometimes use quite a bit of power too. Another issue is that you gotta widen the nose to house the radar, which can affect higher angles of attack. Actually, is there anything other than cooling that can be done for the round engine nozzles? You can try and hide the exhaust, it was done with the F-35 but not very effectively. I suppose so – smoke will make an aircraft visible – irregardless of size. Only other thing I can see is that these aircraft tend to be made of composites. Whether that’s a good idea over time though is an interesting question – especially considering that they’re not going to be easy to repair in that regard. They do have (on paper) a higher strength to weight ratio, but there seem to be issues. Anyways, this guy in 2007 blew the whistle at Boeing about composites potentially being unsafe and got let go. Then in 2008, there was a crash in Guam from a B2 aircraft. The composites shattered and the aircraft burned – it was apparently much more violent fire than what a metal air frame would have made. Again in 2010, there was another B2 incident, involving an engine. The USAF tried to cover up the extent of the damage, but it looks like the entire fuselage had to be partially rebuilt. Apart from the implications that this has for the safety of the newer composites (especially the 787 and A350), the other issue is how well will these composites stand up to the stresses of war? Will they develop microcracks that cannot be seen but cause total losses? How well will they take fire? The pilot got out of the airplane and walked away after that crash, look at the very end, you can see that the wings are almost intact despite the violent crash. A metal plane would have been reduced to rubble. There really is no comparison, zero, between metal and composite materials. There is no way the Rafale, Typhoon or Gripen could withstand such immense G-forces as they do where it not for the incredible strength in their airframes. Some of that strength is visible in the Gripen crash. Strength to weight is stronger yes. That’s not the question. The question is, is it easy to repair? Any fighter that is going to be sent into war will be taking damage. Composites are better than metal at taking mechanical stress etc., but are hard to repair. “Strength to weight is stronger yes. That’s not the question. 2) they are lighter and easier and require less operations to join, then metal parts, witch reduces workload. However that is all dependent on what type of composites are used and how they are used. The examples you gave with the B-2 are valid examples against the use of composites, but not of composites as a whole but on the way they were used in that specific case. Which basically means that usage of materials depends on aircraft’s role. Air superiority fighters are best made out of the composites, while CAS fighters (which fly at slow speeds and need heavy armor) are best made out of the metal. A-10 has no problem flying with patches. But I can’t imagine a Rafale reaching supersonic speed without those patches blowing right out, and taking half a wing with them. Yeah I think you may be right – it depends on what composites are used and how they are used – seeing that composites are a broad term. I think the lesson here is to put the composites into sections which are easy to repair. Downside is that this may end up increasing the amount of joints and rivets. Do you think the optimal configuration may be to have composites as the external skin with a metal frame on the inside? I suppose with CAS aircraft, you could simply bolt on pieces like in WWII aircraft, same with prop-driven FACs. Exactly. As for air superiority fighters, yeah, what you proposed is probably the best option. Okay. You guys have a very strange notion of how an aircraft structure is built. Let me give you a crash course. 😀 (pun intended). First of all since about the 1930s most aircraft structures have been of monocoque design (http://en.wikipedia.org/wiki/Monocoque) . That is the structural load is supported by the skin of the aircraft. This was done to decrease weight as well as increase strength, as this type of structures allows the use of light materials and thick walls to create a structure with the required strength but most importantly rigidity. Rigidity is the most important requirement for an aircraft structure. That is way aluminum is used. In the average aircraft structure the same weight of aluminum alloys is used as would have been used to create a structure with the same strength out of steel. The reason why aluminum is preferred is because being lighter one can make the skin ticker then out of steel and thus more rigid. Now what Chris proposed with an internal structure made of metal and a composite skin makes no sense whatsoever, because the internal structure made of metal having to be light would be very flexible and would offer no rigidity and would give no increase in strength because the composites would probably be stronger then the metal frame. Making a whole structure out of composites is not something new it’s been done for the first time in WWII with one of the most successful allied aircraft: The Mosquito (http://en.wikipedia.org/wiki/De_Havilland_Mosquito). Now you may have heard that it was made out of wood, but in really it was made out of sheets of plywood glued together. The plywood the Mosquito was made off can be considered a composite material because it made use of different hardness of woods combined together to obtain a structure with the desired properties. That is what composites are: the combination of two materials with different strengths so that the whole combines the strengths of the two with none of the weaknesses. The simplest and most common type of composite is reinforced concrete which combines a material with great tensile strength (steel) but no resistance to compression with a material with great resistance to compression (concrete) but with no tensile strength. The resultant material, reinforced concrete has both tensile and compression strength and can be used in structures that bend. Bending combines both types of stress as a bending structure compresses on one side and tenses on the other. Now getting back to the Mosquito, being made out of plywood it had a structure that was actually much stronger then contemporary metal structure, was much more resilient to damage, because the plywood once treated became fireproof while aluminium cannot be fireproofed, and it was much more cheaper and easier to produce because being made of non strategic materials it had ready access to resources, pieces of it were constructed in piano shops and it was glued together which made battlefield repairs very quick. Now modern composites are much more harder to work with then plywood but that is because they are still and emerging technology. The difficulties associated with composites come from requiring hot glue to join them together , vulnerability to the elements, necessity to bake the pieces in ovens etc. Still new technologies will make them much easier to work with then metal: for example new types of glue and cold welding are emerging which do not require heat which makes joining parts made of composites as simple as gluing two pieces of paper, or composites made of materials that do not require baking in a oven to lock in the desired shape or even self healing composites. The examples you guys gave with the F-22, Boeing 777 and B-2 are all first generation composites. The composites used on the Rafale, Typhoon and Gripen and much more advanced and easier to work with. The ones on the Gripen NG will be even more modern and easier to use and repair. For example I heard that the Gripen NG uses carbon nano-tube based composites which explains why while the Gripen NG is bigger then the Gripne C/D it’s actually about a ton lighter when empty. Carbon nano-tubes offer such strength that no metal can compete with them, and they also don’t have many of the environmental vulnerabilities that older composites like epoxy based ones had. Composites are the future weather you like them or not. But composites do not mean just plastic, the way Chris seems to think. Most modern composites are a combination of metal with plastic, or resin. But for CAS aircraft, monocoque design might not be suitable as it has to be able to take damage to the skin. A-10 has monocoque design. And it can sustain a huge amount of damage, samne for Su-25. If you use an internal structure the only way we can make the aircraft light enough and rigid enough to fly is to make the skin very thin, like fabric thin, because the internal structure would have to bee very heavy to achieve the required rigidity. It defeats the whole purpose of putting Armour on the aircraft. I talking about the current epoxy composites. It’s hard to refer to composites like “composites” the way someone would refer to “metals” in a sense. But at the moment, they do have their share of issues. That will likely change in the future, but for now, they do. Of course, it’s not alone. Titanium for example is very hard to weld with and quite costly so its only used in strong parts. When they are making planes with carbon nanotube or graphene even, then yes, they will outperform current aircraft materials substantially. I recall that graphene was quoted as having about 2 orders of magnitude more strength to weight. Without the final specs for the NG we really are in no position to judge. I suppose though that there could be later versions for the Rafale and the other fighters too that could be a big upgrade with nanotube composites. I expect in the long term that they will be as well. But as indicated, we are talking about what is available today. Of course, I expect that graphene for example could lead to other revolutions, such as in the electronics industry. Strictly for fighters, that could lead to a new generation of sensors. If this could be refitted with existing materials, it could have huge implications. Of course, it assumes graphene can ever be massed produced. Don’t know why My computer autocompleted to”Grey” above. It’s a nickname I use in other places. Anyway, I believe Tor is what I usually call myself here (it is also my real name). Fantastic post by Andrej on composites, thanks. What you write about “skin structure” also applies to boats. One of the reasons the Viking dragonships where such incredible and versatile designs where because their skin was their skeleton. I don’t know the English terms here, but basically a ship of this type has no internal frame. The sideboards is the frame. The overlapping way they are put together created a structure far far stronger than the designs used by later ships. The Viking ships did not need a pier you could pull them on land, something that would destroy the later skeleton based ships. There is a new backpack out that uses composite birch frame rather than metal. Apparently as strong or stronger while having a much smaller environmental impact than for example aluminium. I think the technique the Viking boat builders used is called “clinker building”. A boat building craft and tradition that still lives in some pockets in Scandinavia. These fishing boats are made with the same technique, which is why they can withstand being brutally dragged onto land every day. 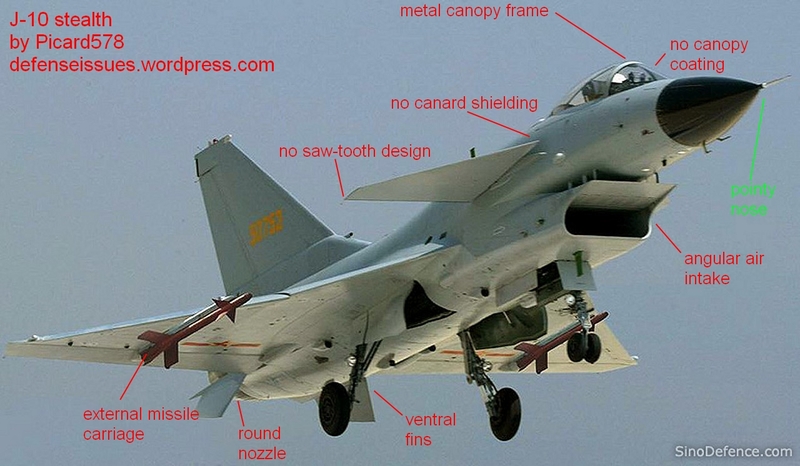 “Pointy nose…” And you think this is a design required for “stealth”? The air intakes are one of the bigger problems for “radar stealth” and Gripens intakes are smaller than Rafales plus it has radar absorption inside the duct. 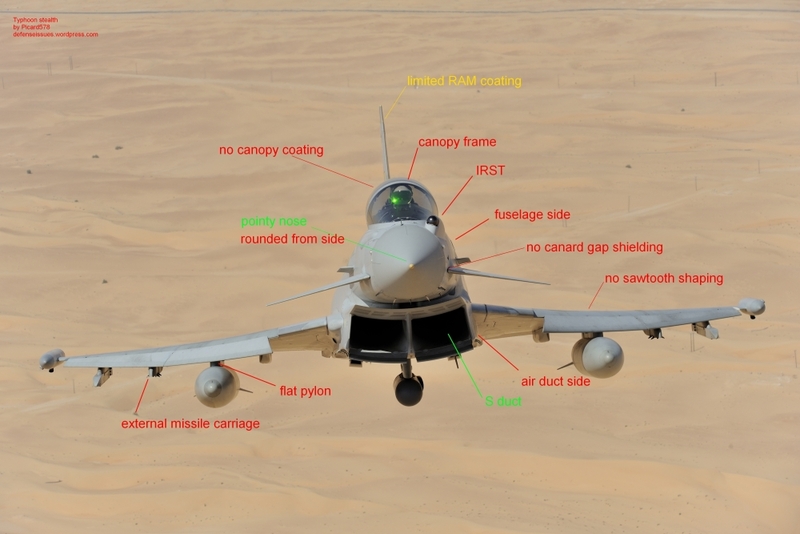 The canards of the Typhoon is a bad stealth design since they are not in the same plane as the wing, becomes difficult to plan a route to avoid radar detection when “no detection angle” is limited. You can have a rounded nose a la the A-10, but it is not good for the RCS. As for rounded shape, notice that it is in RED, which means that it is bad for stealth. Canards never are good for stealth.